With the approach of Spring and the re-opening of our tramway, work has stepped up towards completion of our major trackwork renewal project at Glory Mine. 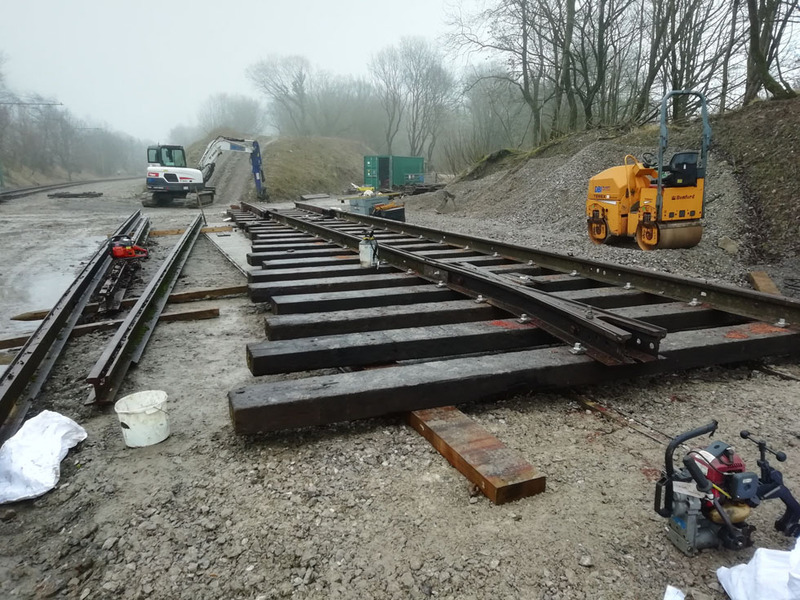 In our last update we showed you how fresh ballast was being levelled and compacted to form a firm base while the necessary pointwork for the passing loop was away off-site being refurbished. 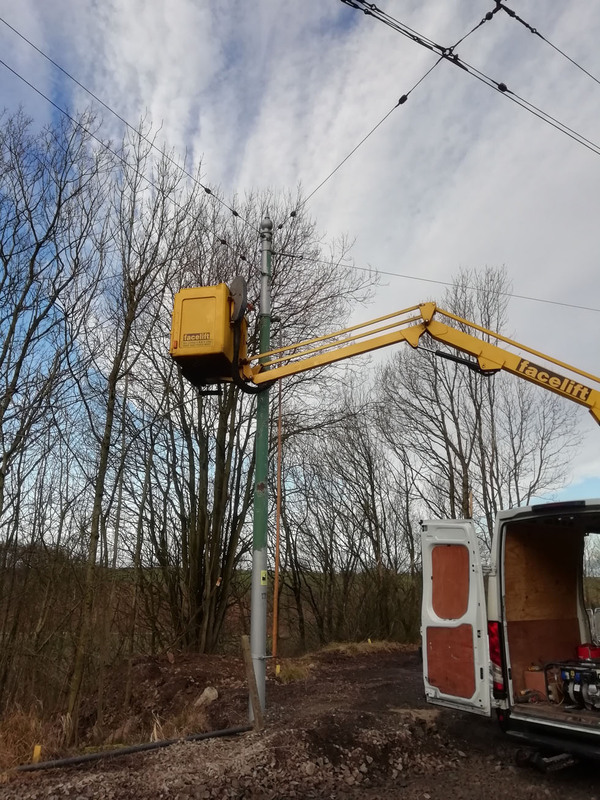 Following the Christmas break, one of our contractors has been busy repainting the ten traction poles that support the overhead wiring around the terminus. This is an important task as it not only improves the look of the poles, but helps protect them from corrosion and potential degradation following 40 years expose to the Crich weather! With the refurbished pointwork delivered back to site, the next task was to assemble these into turnouts of the correct radius. 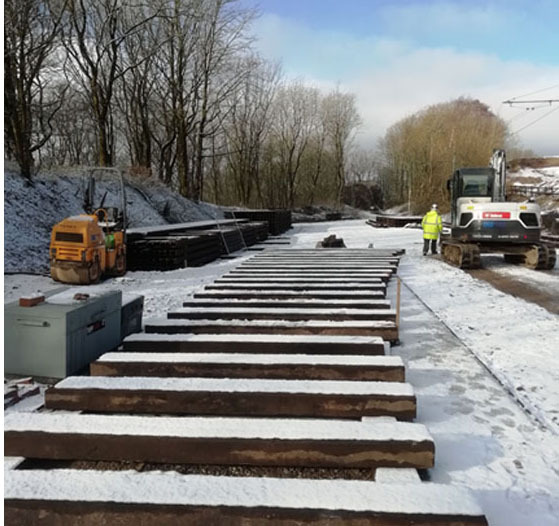 In a snowy permanent way yard, timber bearers were laid out to match the correct dimensions of the finished trackwork. Over a five day period a six-man strong track team from our friends at 1st-in-rail worked hard to put this complex jigsaw together, drilling and fixing sleepers, bending rail, and carefully locating the switches and crossings to millimetre tolerances. Once the two points was assembled, the whole puzzle was carefully numbered, disassembled and transported to Glory Mine like a giant flat-pack for siting in their final locations. With the major hurdle of locating the north and south points into the passing loop now complete, work could focus on installing the straight plain line between the two. 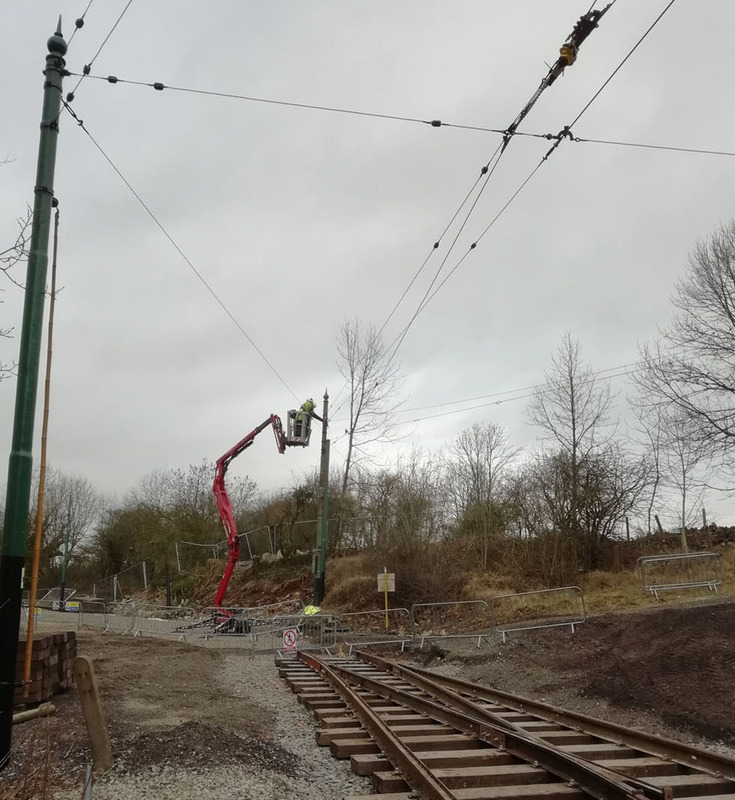 Meanwhile aloft, our overhead line team have been making the necessary alterations to make the new terminus layout operational for our vintage tramcars. 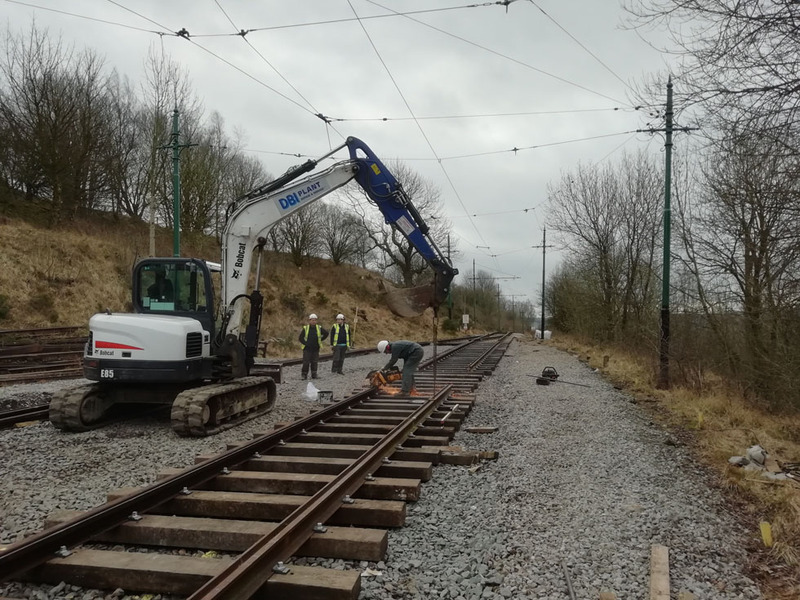 This work includes installing several new lengths of trolley wire to the stub at the far end of the line, altering existing spanwire, fitting new insulators and installing a replacement traction pole! 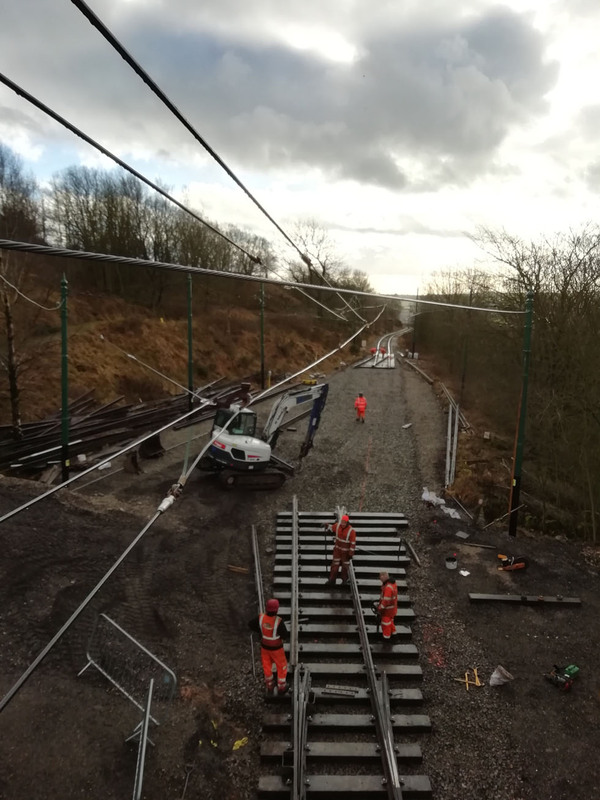 As we enter the closing weeks of the project our focus will be on forming the curved sections of trackwork, installing top ballast, finishing overhead line arrangements, and a whole host of ancillary tasks necessary before the terminus can be reopened to passenger traffic.